4ft 6in x 8in Inglenook style test track developed into a multi mode layout. Layout idea Some variations on the theme. . .
Inglenook variations: three alternative plans. US N gauge on an ironing board. Inglenook based shunting layout 3ft x 9in. With notes on the ironing board as a base for a layout. British freight yard set in East Anglia. Mini (3ft x 6in) diorama showing German Sleeping car company service area with background information on the Mitropa organisation. US switching layout with sector plate at one end and a turntable at the other. 6ft x 1ft+ in HO scale. More on French layout originally featured in Issue 25. 7 1/4 inch gauge garden railway built from scratch! 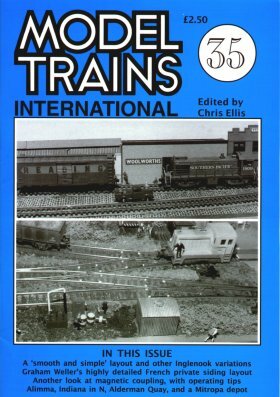 Description of track & stock.